It’s midseason and the Hawks are in their usual discovery mode, trying to figure out how to improve their offense enough to make a Super Bowl run. They have failed the last two years, coming up way short in the divisional round on the road each time, and they look like they are headed down the same path this year. In their pursuit of home field for the playoffs, the Hawks really needed to beat Washington — one of the easiest games they had left. They would have then been 6-2, just a game and a half behind NFC-leading Philadelphia (8-1), which has a bye this week. A win Thursday then would have put the Hawks at 7-2, one game behind, with the Eagles coming to Seattle in Week 13. Now, the best Seattle can do is trail by two after Thursday and hope the Eagles stumble. Even then, it looks really hard for the Hawks to make up ground. They will be lucky to win the NFC West. FiveThirtyEight gives Seattle a 57 percent chance of making the playoffs and a 44 percent chance of winning the NFC West — a goal that will rely largely on the result of the Week 15 game vs. the Rams in Seattle. 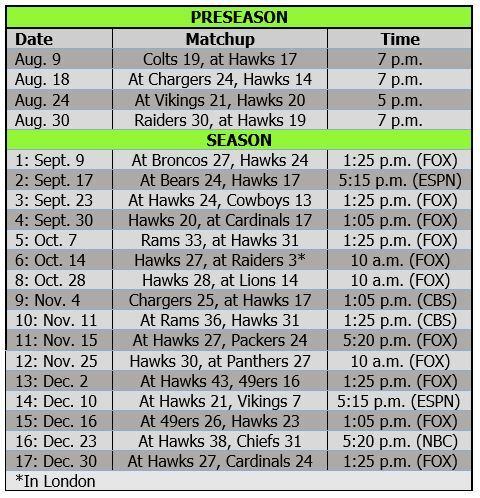 Assuming they don’t lay any more eggs, the Hawks still look like a 10-win team that should make the playoffs. But FiveThirtyEight gives them just a 4 percent chance to win the Super Bowl at this point, and there’s no reason to argue with that assessment. Of their remaining eight, they should win at Arizona (4-4), at San Francisco (0-9) and home vs. Arizona. But they have three tough home games, against Atlanta (4-4), Philly and the Rams (6-2), plus hard road games at Jacksonville (5-3) and Dallas (5-3). They could easily go 2-3 against that five, giving them just 10 wins. Can the Hawks do better than 10? Only if they cut way down on the penalties (they lead the league) and find a running game outside of Russell Wilson. They showed possible progress in the latter against Washington, with the tailbacks gaining 71 yards on 18 carries. The Hawks actually rank fourth in yards per game (379) and 10th in points (23.6). But the scoring is inflated by the 89 points against the Colts (3-6) and Texans (3-5) — the Hawks are averaging just 17 points in their six other games. They are just 19th in red zone touchdowns (50 percent). “I think it’s (us) getting in our own way too much,” Carroll said. “We haven’t scored and the red zone numbers haven’t been quite what we want. I think these penalties creep into this as well. It certainly looks possible this week. Arizona’s defense is giving up 350 yards and 25.1 points per game. San Francisco’s yields 380 and 26.6. 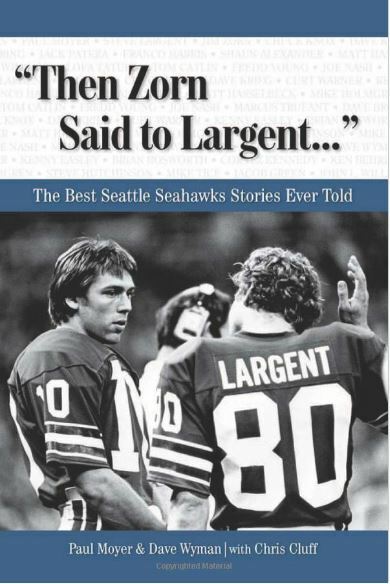 So Seattle should be able to score against those teams — and win all three. But the five other games are going to be difficult. Atlanta’s defense is ranked 12th at 322 yards and 21.5 points. Jacksonville is giving up a league-low 14.6 points and just 281 yards. The Rams and Eagles are giving up a little under 20 points, and the Eagles have the league’s top-ranked run defense (66.4 yards). That’s four tough defenses in the final eight. Meanwhile, four of the final eight are ranked in the top eight in scoring — the Rams No. 1 at 32.9 points, the Eagles No. 2 at 31.4, the Cowboys No. 4 at 28.3 and the Jags tied for eighth at 25.8. Seattle is giving up just 18.6 (tied for fifth), but the Falcons, Eagles, Jags, Rams and Cowboys are all going to be tough outs. Three of those games are at home, where Wilson & Co. have lost just seven games since 2012. But the horrible loss to Washington shows home field might not mean much for Seattle this year. Three of their four games have been three-point margins (12-9 win over 49ers, 41-38 win over Houston, 17-14 loss to Washington), and Atlanta, Philadelphia and Los Angeles are better than those clubs. So, sitting at 5-3 with a pretty difficult second half facing his Seahawks, what does Carroll think? The Eagles and Cowboys will be a challenge but the Seahawks match up well against the rest. 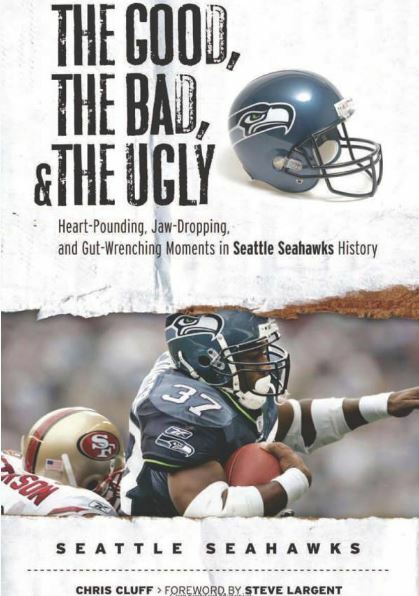 The Seahawks always seem to play well against better teams and are prone to sloppy play against lessor opponents.